Ocala, Florida — When Deputy David Grantham was dispatched to a domestic disturbance call in the 5500 block of SW 129 Place Road, he was met by a female with tears rolling down her cheeks. She told Deputy Grantham after she returned home from working the night shift, Tavis Jamain Johnson, 30, woke her because he was upset about a Facebook post. The victim told the deputy she and Johnson argued, and then Johnson grabbed her by her arms and pushed her up against the wall. The victim told the deputy she tried to get away, but Johnson threw her to the floor causing the back of her head to slam onto the floor. The victim stated Johnson continued to slap and hit her in the head and chest area until she was able to break free. According to the victim, after she broke free, she noticed a garbage truck passing by, so she ran outside to ask the men for help. The victim told the deputy she and Johnson have lived together as a family for 12 years and have six children in common. According to the deputy, two of the children witnessed the abuse. According to reports, the victim had bruising starting to form on the inside of her arms and lower legs. She also had swelling and redness to her cheeks as well as an abrasion on her left breast area. Deputy Grantham stated that as he was finishing his interview, Johnson actually called the residence. The deputy spoke with Johnson who informed the deputy he had fled, hitched a ride, and was in route to Tampa. He refused to give the deputy his exact location. According to the deputy, when Johnson was asked what happened he said he [Johnson] and the victim argued. The deputy then asked how she got her injuries and Johnson replied, “I must have scratched her because I have long fingernails.“ When the deputy asked why he even put his hands on her at all he replied, “I guess I shouldn’t have.” Johnson then hung up on the deputy. The men driving the garbage trucked confirmed that the victim did in fact run outside naked from the waist down and asking for help. The men stated that the victim told them Johnson was beating her and she needed help. The garbage men who were in the right place at the right time called 911 saving the victim from further trauma. 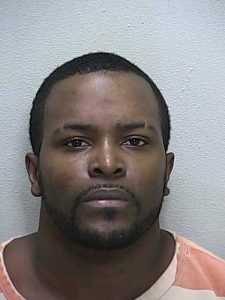 Johnson was convicted in April of 2008, and served seven months in the Marion County Jail for Domestic Battery Touch or Strike. Upon Johnson’s release, he was arrested again for driving on a suspended license, which violated his probation. Tavis Johnson charged with Felony Battery and booked into the Marion County Jail. He was released Tuesday night on a $2,000 bond. He was caught after returning to his residence. It is unclear what was written in the Facebook post.